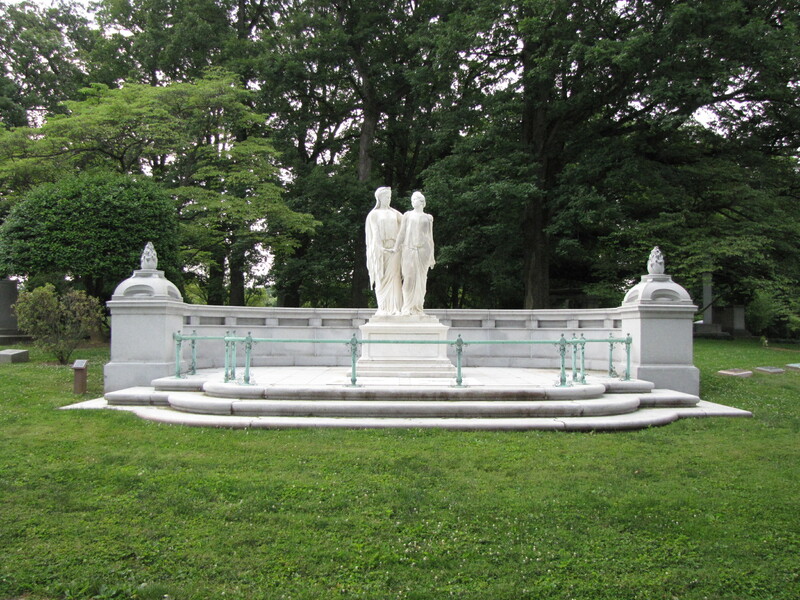 Positioned at the center of an exedra in Section 13 of the Cave Hill Cemetery at Louisville, Kentucky, stands two Greek marble statues. An exedra is a semi-circular structure, often with a bench with a high back. This type of classical architectural device was designed in antiquity to facilitate philosophical discussion and debate. In cemetery architecture the exedra is usually part of a landscape design. Here it adds to the classical design of the Caldwell monument that has as its focal point, two classical statues. The portrait statues are of Mary Elizabeth Breckenridge and Mary Guendaline Byrd Caldwell, daughters of William Shakespeare Caldwell who made his fortune building and operating gas plants throughout the Midwest. Both daughters married titled European aristocrats. Mary Guendaline was first engaged to the Prince Joachim Murat, the grandson of the King of Naples, who was not only twice her age but an invalid. The engagement went awry when the couple could not agree on how much of Miss Caldwell’s fortune was to be given to the Prince. The heiress’ wedding announcement was reported in newspapers from around the country including The Saint Paul Globe, Tuesday, on October 20, 1896, with the headline, MARRIED IN FRANCE: Titled Gathered in by a Well-Known American Woman, (spellings are as they appear in the article) Paris, Oct. 19—Miss Mary Gwendolin Caldwell founder of the divinity school of the Catholic university at Washington, D. C. was married today at St. Joseph’s church, Avenue Hoche, this city, to the Marquis des Monstriers-Merenville. Bishop Spaulding, of Peoria, Ill., the guardian and administrator of the estate of Miss Caldwell, assisted by Father Cooke, officiated. Punctually at noon the pair entered the church and occupied seats beneath a canopy of flowers. After a complimentary address, Bishop Spaulding performed the marriage ceremony, which was followed by a mass, celebrated by the Chanoene Father Dufort, superior of St. Phillippe de Roula a friend of the bridegroom. The music was superb. The witnesses for the groom were Counts Henri and Pierre Des Monstreiers-Merenville, and the bride’s witnesses were Mr. John Carter and Bishop Spaulding. Among the guests presents were the duke and duchess Doudeaville, the marquis and marquise de Dimecourt, the Court de Turenne and the marquis de Vogne. The Marquise’ health declined and the couple separated. She suffered from paralysis and was unable even to speak only communicating through writing. The Marquise des Monstiers died aboard the German ocean liner Kronprinessin Cecile in her stateroom on her way to America. MARQUISE DIES ON LINER SHE HAD HOPED TO REACH AMERICA BEFORE END CAME: The Marquise Monstiers-Merenville Was Miss Caldwell of Kentucky—She Got The Order of the Rose From Pope Leo XIII., but Later Renounced the Church. When the North German Lloyd liner Kronprinzessin Cecilie was within sight of Sandy Hook early yesterday morning one of her most distinguished passengers, the Marquise des Monstiers-Merinville who had expressed a wish to die on American soil when she boarded the liner on the other side, breathed her last in the presence of her private physician: Dr. R. Ohle, the ship’s surgeon; her secretary, an Italian courier and three nurses. She had requested all of them to be with her at the end. She had hoped when she sailed that she would arrive here well enough to see her old physician, Dr. Allen Starr, and some of her friends. The Kronprinzessin Cecille made one of the fastest trips in her history, beating all German records for a day’s run by reeling off 604 miles on the day before the Marquise died, but the special effort of her commander to bring in the Marquise alive failed by about six hours. The Marquise was originally Mary Gwendolin Caldwell and she attracted public notice about twenty years ago by her engagement to Prince Murat, grandson of the King of Naples. The engagement was broken because she refused to settle on him half her fortune then estimated at about $2,000,000. Her father, William Shakespeare Caldwell made his money building gas works. The Marquise was born in Kentucky and was of Breckinridge stock. She and her sister, Lina Caldwell, who married the Baron von Zedwitz, were educated at the Convent of the Sacred Heart at Manhattanville. Her father, who was originally a Protestant, had been converted to Catholicism by Archbishop Spalding. The father left all his fortune to the girls, entrusting it to the care of Bishop Spalding of Peoria, Ill., a relative of the Archbishop. The Marquise donated $300,000 to found the Catholic University at Washington, giving eighty-eight acres of land on the outskirts of the city and erecting three of the university’s largest buildings. Her interest in the Church inspired Pope Leo XIII to confer on her the Order of the Rose, a distinction never before given to a woman. She was married in Paris on October 19, 1896, to the Marquis des Monstiers-Merinville by Bishop Spalding. The union brought unhappiness to her and she separated from her hsuband after her health had broken down. She became paralyzed below the waist and partially blind and deaf. In 1904 before these afflictions came she renounced the Church and published a statement about her decision that caused a sensation in Catholic circles. In December 1904, and effort was made to have her reconsider her renunciation, the Pope receiving her in special audience, but she did not change her decision. At her request the trustees of the university removed her portrait from the wall of the main parlor of Divinity or Caldwell Hall and sent it to her home. The portrait of Cardinal Martinelli was hung in its place. The Marquise’s friends said she did not embrace any other faith after she gave up the Catholic Church. She asked for not priest or minister before she died. The Baroness von Zedwitz, who is a widow, her husband having been killed in 1896 in a coalition between his yacht and that of the Emperor William, was notified of the Marquise’s death. Word was also sent to the Marquis, who is living in Paris. The Marquise was 48 years of age. Mary Elizabeth Breckenridge Caldwell married the German nobleman and diplomat, Baron von Zedtwitz (1851-1896). Baron von Zedtwitz served his country as secretary to the Russian, then American embassies. He then served as Minister to Mexico. He died in a tragic yachting accident at the Royal Albert Regatta when his yacht, the Isolde, collided with German Emperor Wilhelm’s yacht the Meteor leaving the Baroness a widow. News reached this city yesterday that the Baroness von Zedtwitz, who was formerly Miss Elizabeth Caldwell of Louisville, Ky., died on Dec. 16 from heart disease at the Carlton Hotel, Frankfort, Germany, at the age of 43. Once distinguished for her lavish gifts to the Roman Catholic Church, the Baroness von Zedwitz achieved even more prominence six years ago by writing a book attacking it. She was the daughter of William Shakespeare Caldwell, a wealthy resident of Louisville, who had originally been a Protestant, but who had been converted to Catholicism. Both Mary Elizabeth and her sister, Gwendolyn Caldwell, were brought up in the latter faith. Both girls inherited several millions from their father, and for years gave large sums for the erection of Catholic institutions. Fourteen years ago Mary Elizabeth married Baron von Zedtwitz, a member of the German Diplomatic Corps at Washington. The Baron immediately, after the marriage, was appointed the German Minister to Mexico. Within a year after the marriage, however, he was killed by the fall of the mast of his private yacht, the Isolde, which came into collision with the yacht Meteor off Southsea. The Baroness, after her husband’s death, gave still more lavishly to Catholic institutions. She had residences in New port and Louisville, but she spent most of her time abroad. In 1904, greatly to the surprise of her friends, she announced her intention of renouncing Catholicism. Her reasons were afterward published in a book entitled “The Double Doctrine of the Church of Rome.” Her sister, who shared her views and had become the Marquise Monstiers-Merinville, died last October. The Baroness leaves a fourteen-year-old son, Waldemar Zedtwitz. She will probably be buried in Louisville. The Caldwell sisters are depicted in classical clothing giving them a regal appearance. The patina of the marble makes the statues look translucent, almost as if light is emanating from within. The monument was erected between 1910 and 1912 by the Harrison Granite Company of New York City and the statues were designed and executed by famed London artist and sculptor Gilbert Bayes (1872-1953). 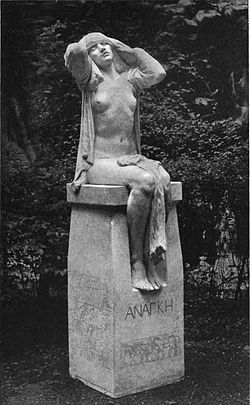 Bayes was associated with the British New Sculpture Movement which had architectural sculpture as its main focus, though; he is most likely best remembered for his association with the Royal Doulton Company and for his stint as President of the Royal British Society of Sculptors (1939-1944). I saw this memorial many years ago and became fascinated by it as it was suppose to have perpetual care but was in disrepair i called the cemetery and was told “perpetual care is only for 100 years” but then was told that steps were being taken to rectify this – hope it was done. Hi Sheila. 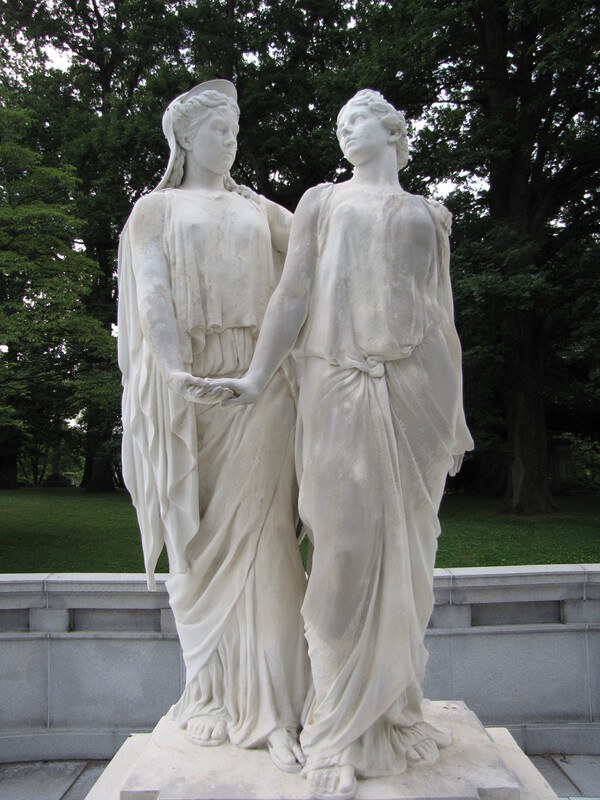 In response to your concern for the Two Sisters Caldwell memorial located in Cave Hill Cemetery in Louisville, Kentucky, I would like to assure that efforts have been made to “clean the girls up”. A restoration committee had been established in 2010 for in particular care of this precious grave. I have not lived in Louisville for many years now but still vividly remember the Caldwell sisters and a small book one wrote available at the Philson club that I read and she was pretty upset with the catholic diocese of Louisville but it has been many years since I read the small publication.. I had recently told my youngest son about them – I am not sure why the sisters and the book have stayed on my mind since the 1970’s – so what is planed for the Caldwell sisters now? and is there a way to help this project along? I re read the article about the Caldwell sisters and realized there was a son( of Mary’s) who was a confirmed bachelor who died in 1984 – during world war 1 his monies were taken from him as he had dual German American citizen ship and considered an enemy.- could not find out if said monies were returned and since he was without heirs what happened to his money and would’ve gone towards upkeep of his resting place to include his mother and aunt’s? I first ran across the sister’s in 1979 – I have no clue why this subject keeps popping up in my head.